Fortunately, REDcard wasn’t isn’t the only method of manufacturing points and miles. In fact, there are tons of other methods available, it just requires a bit of research and experimentation to find what works. There’s no lack of options when it comes to manufactured spending. It’s simply a matter of what you feel comfortable doing. For example, most methods of manufactured spending require human interaction. Some people may feel uncomfortable dealing with someone when moving around thousands of dollars at a time. If that’s the case, there are online only options available as well, they’re just not as common. So, now that REDcard credit card loads are dead, what options do you have? Quite a few really, but before we get into it, I think it’s important to read the following three posts (if you haven’t already). Despite the loss of in-store credit card loads, REDcard is still alive and kicking… just not quite as much. You can still load PIN enabled prepaid debit and gift cards to Target REDcard in store and bank issued debit cards online. It’s not as simple a process as credit card loads were, but it gives you the ability to take advantage of category bonuses versus just taking the easy route. Frankly, it’s not even that much more work. It’s just one more step: CC > GC > RB. There are fees involved in this method, but depending on the amount of points you earn, the profit should outweigh the expense. For reference, this post by Doctor of Credit is worth reading regarding manufactured spending costs. Serve and Bluebird are also good options to manufacture spend with going forward, however, you can only have one of these three Amex prepaid cards. If you’re unsure as to which card is right for you, check out this post. Different versions of Visa Buxx have been around for years now, with the best one being US Bank’s. Unfortunately, US Bank doesn’t allow new sign-ups for that card, but if you have one lying around, it may be time to look into MSing with it again. If you don’t have a US Bank Visa Buxx account, Nationwide Buxx is still available. It doesn’t offer as many manufactured spending benefits as US Bank does, but it’s an option regardless. With that card, you can load $500 per day with a max of $1,000 per rolling 30 days. It’s not much, but every bit of manufactured spending counts when you have to hit a large amount of sign-up bonuses. You can find more information out about Nationwide’s Buxx card on Flyertalk or via the links I posted above. Buying money orders with PIN enabled debit/gift cards (see a trend here?) is a great way to MS. MOs can be used as a back up plan, as a supplement to an already great MS plan, or as a full-blown way of manufacturing large amounts of spend. The beautiful thing about buying money orders is that there are no limits. You’re only limited by your comfort zone, the comfort zone of your CSRs, and your time. That being said, MOs are commonly used as laundering machines making them risky. Many banks and people are sketched out by them, so it can be a very tough manufactured spending technique for some. For example, if you buy over a certain amount of MOs or deposit over a certain amount of MOs in your bank, chances are they will fill out a SAR (Suspicious Activity Report) on you. If this happens, then the IRS, bank, government officials, and/or other important people can and will likely start looking into your finances and transactions. For most people, that’s not a big deal, but for some it may be. Paypal is fickle beast. Some days you hear news about them banning multiple people and other days, they’re super profitable for the MS world. Fortunately, I’ve almost always fallen into the latter category. If you’re comfortable dealing with Paypal, they offer great methods of manufacturing spend. For example, they offer My Cash Cards which can be purchased at some grocery stores and pharmacies for $500 with a $3.95 fee. If you have a card that earns category bonuses at these stores (eg. Old Blue), then you’re really in luck! Those My Cash cards can then be loaded to Paypal and transferred to your bank and/or spent with your PPBDMC. The former option tends to lead to shut downs. The latter not so much. There are manufactured spending techniques all around us even with the demise of REDcard’s in-store credit card loads. The trick is to research and experiment. Frankly, without researching and experimenting in your own neighborhood, it’s going to be a challenge to MS. After all, most national deals die a lot quicker than local ones. 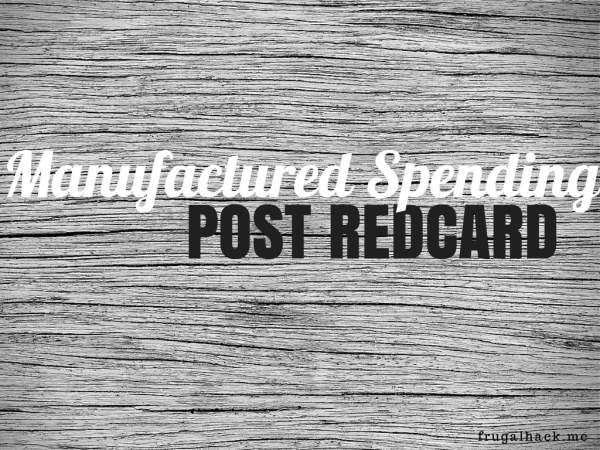 Now that REDbird has changed, what is your preferred way to manufacture spend?